Twelve years into this relationship, I am proud to say that I have mastered the alphabet, learned hundreds of words, can order a meal for myself and make basic pleasantries, but yet also appalled at myself as I have not made the rest of the language a priority for the relatively small time we are in Turkey each year. I am also lucky to have a family in law who speak English, which has spoiled me. “You just sit on your hands and listen,” was the advice I received from a sage elder when talking about how to handle such situations as prolonged Turkish language dinners. And indeed, I (along with Kenne the Queen of Manners) agree with this…but let’s get into the niggeldy piggeldy details about exactly HOW to survive. As the night begins your earnest smile will be true and steadfast. Go with this flow as long as possible – ride it like a wave. After 12 years of this, I usually get the basic gist of what’s being discussed and perhaps you will too. Look at each person as they talk. Curb your impulse to ask if the group is talking about this or that as the conversation wanes before shifting, it is annoying. When your husband does translate in a summative way, don’t ask questions or try to add to the conversation belatedly- it’s just too awkward. When people do make an effort to include you, rejoice despite your exhaustion and pay careful attention, they are being kind! Give it your all – this is your moment to shine. You will not have too many of these as the night goes on. Don’t expect your husband to translate – it is just too much and this is his time to reconnect with his friends and family. In other words, be a good little wife and mean it. There is a time and a place for this – and you are here. When your hostess invites you to accompany her to choose the meze (tapas), be honored but don’t show off your knowledge of Turkish food words because she will think you want all of those meze and that will not help your case around not being an obese ravenous American. If as the wave of willingness to focus on the conversations is cresting, a Turkish acquaintance of your host’s comes over and greets and talks to everyone but you, don’t take it personally, even if you have met her five times before at the same lokanta (restaurant). “Turks,” M. Says “are shy if they know you don’t speak Turkish, they don’t know what to say to you – or if she should speak Turkish to you.” Try to accept these words which feel a paltry excuse for something Ms. Manners would faint at. Smile, do not seethe quietly, it is unbecoming. As the focus wave begins to diminish, and you begin to feel cross eyed in the face of so much concentration, engage more intently on catching the few words you do understand. Count them, hypothesize on their connection, make rhymes, but keep watching each person speak. And consider getting some Botox to smooth your emerging frown focus wrinkles on your forehead. Make mental notes of commonly-occurring words that need to make it onto your flash cards at home. Make a mnemonic device to remember them when you get home. By now, the meze will have arrived and you can focus on serving yourself one bite at a time without dropping any olive oil on the tablecloth. This gives you a break from the tennis match that is watching words come out of the mouths of your dinner companions. For extra good measure, you can serve a few bites to the other guests, starting with your husband. Feminism be damned. As the night winds down, roll out all of the pleasantries you know for thank you, delicious food, etc. and renew your Rosetta Stone subscription ASAP (or your Valium prescription at the very least!). But most of all, keep on trying! You’ll be back for another round in a few hours! 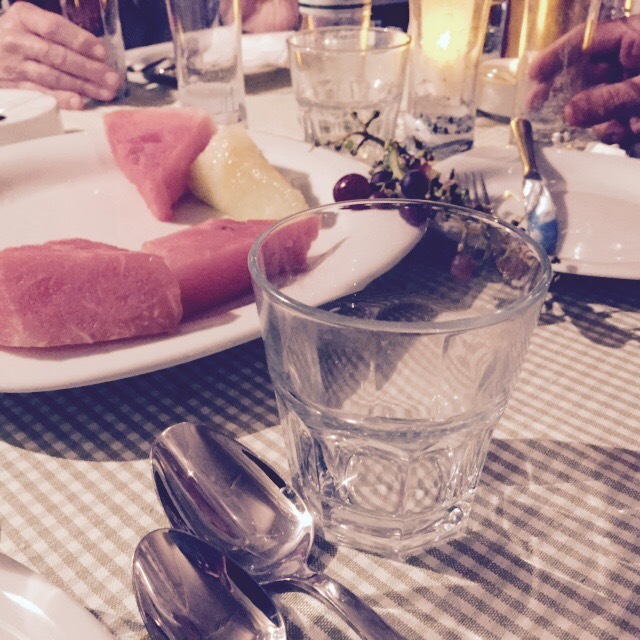 This entry was posted in Cross-cultural learning moments, Gendered moments, Turkish Food!, Turklish Moments and tagged cross-cultural marriage, etiquette, food, frustration, language learning, Turkish. Bookmark the permalink. . . such a fine encapsulation of the language challenge – some have the aptitude and some of us don’t! We have an elderly neighbour, a dear man who always stops by to chat, drink coffee on his way back from his field/foraging chores. As is required by those of his generation, it is Janet who must go and make the coffee, etc whilst he engages me in lively conversation about this and that. When the coffee arrives, five or ten minutes later, he will say to Janet (yet again) ‘He doesn’t understand a thing I’ve been saying – you tell him.’ (she will have been listening from the kitchen). This is the joy and the pain of having such fine village friends and neighbours, they know I don’t follow too well what they are sharing (much of it in village dialect, anyway) but they never cease to continue engaging with me. I am honoured and ashamed in equal measure but would not change them for the world. What a picture you have painted! Yes, the joy and the pain!